Last night, I dreamt that I was wearing my white lab coat and was rushing to go somewhere. I had just finished my shift from the hospital and was heading into a building. I didn't even change my clothes, I proceeded to enter the building  it was the Raaja-Rajeswari Temple. As I entered it, there were many devotees inside who gathered. Among them, was a familar face, my uncle (who imparted a Thiruppugal song when I was eight years old  which to this day is one of the reasons I am still a Hindu else I would have converted to Christianity or some other alien faith). This uncle is sometimes used by Murugan in my dreams to deliver messages to me. In the dream, my uncle looked at me and smiled and said [in Tamil], "Welcome, doctor. Come inside." I stood before Him (?Murugan) and at that time the other devotees proceeded to exit the temple  it was just me and Murugan. He then spoke [in Tamil], "It's a shame that the priest of this temple doesn't talk much about Murugan." As He said this, I noticed that it was with a worrisome tone in which my uncle/Murugan spoke. He then sat beside the big yaagam (homa) pit and lied down to rest. I stood before Him at His feet. When my uncle uttered the word "Murugan", I closed my eyes and contemplated on Him. As my eyes remained closed, I felt something materialize in my hand. As I opened my eyes, in my hands - to my delightful surprise - was a book entitled with big capital letters, "Sri Arunagirinathar Swaamigal's KANTHAR ANUBHUTHI." I was so happy to see this in my hands. I wanted to wake up my uncle/Murugan who was sleeping at this time to show Him the book, however, I thought, "I'll let Him sleep. I'll hold onto this book until He wakes up." 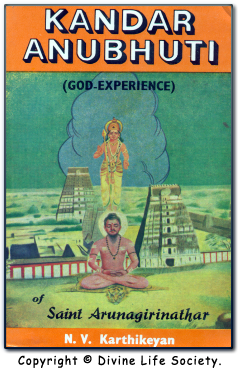 So there I was standing at Murugan's Feet and holding the sacred work, "Kanthar Anubhuthi" in my hand. I recall turning the pages and reading the descriptions and translations which were all in Tamil and English. It was then when I woke up. Thank you my Lord for coming and showing me the way to your sacred Feet. I will continue my daily paaraayanam of Kanthar Anubhuthi and spend more time to study its full meaning and apply it in my life. By so doing, I hope to realize you - my dear Lord - in this birth itself. My mother visited me today. During this visit, she happened to touch upon a conversation she had with her twin brother (my uncle  the same one that appeared in my dream). He had told her without any mention of me on my mother's part, "Tell [my name] to sing everyday  Kanthar Anubhuthi...Murugan will take care of him." I was stunned to hear this. I retold the above dream to my mother and said, "It really was Murugan who came in my dream and now He is giving me the same message through your brother." Thank you Murugaa! Kumara! Karthikeya! Shanmugaa! Velaayudhaa! Eswaraa! Ammaa! Vadivela! Skanda! Saravanabava! Yen-Gurunaathan-appaa! I love you with all my heart my loving ever bountiful ever giving, karunaiyin vadivaana alagaana anbaana deivam! Your child  who longs to have your darshan.